Mohnkuchen – Dig Delve – An online magazine about gardens, landscape, growing & making. My childhood interest in cooking was first encouraged by my maternal grandmother. When I was about 7 she taught me how to make scrambled eggs on toast. Then, during our summer holidays on the Gower, she followed this with instruction in the cakes from her pantheon of Welsh standards – Bara Brith, Welsh Cakes and pikelets – and, from Marguerite Patten’s ubiquitous wartime cookbooks, she introduced me to the classics – scones, jam tarts, rock cakes and Victoria sponge cake. When we started to travel further afield to Brittany for our holidays I was always drawn to sample the baked goods; proper butter croissants and pains au chocolat at the ferry port, quite unlike the frozen Pilsbury Dough ones I had eaten at home, palmiers, millefeuilles and éclairs from the patisserie near the camp site, and from the markets we would buy buttery Gateau Breton, custardy apple cake and indulgent kouign-amann. Brought up on Cadbury’s Mini Rolls and Mr. Kipling’s Fondant Fancies these cakes were so exotic to me that I would return home wanting to try and make them. At 17 I went to Austria on a student exchange and here I discovered a whole other world of cake; Sacher Torte, Linzer Torte, Apfelstrudel, Marillenknödel and Zwetschgenknödel (potato dumplings stuffed with whole apricots or plums respectively) and my first proper baked cheesecake studded with juicy raisins, which was a far cry from the chalky refrigerated ones with their gelatinous fruit toppings that I was familiar with. However, the cake that lodges most firmly in my memory is the Mohnkuchen I ordered in a Café-Konditorei in Salzburg. When I saw it on the menu I asked my host family what Mohn was. 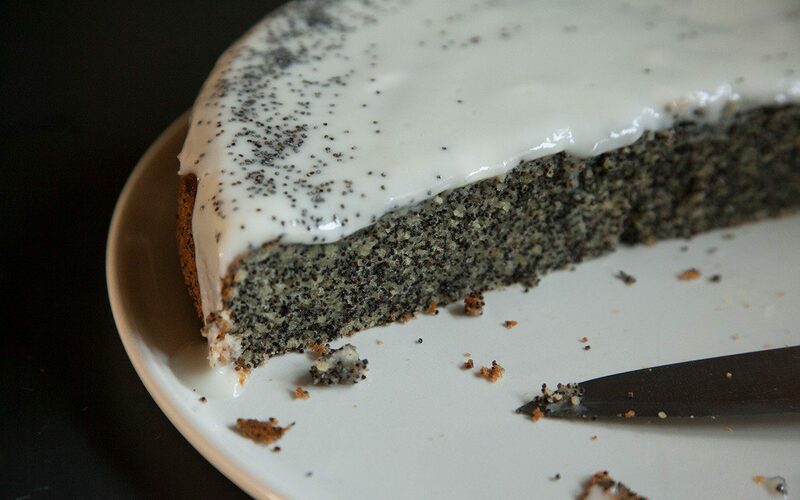 When they explained that they were poppy seeds this seemed to me so sophisticated and unusual an ingredient for a cake that, with my awkward teenage desire to appear sophisticated and unusual, I ordered it. When it arrived at the table my suspicions were confirmed by its rather austere appearance, and its minimal crust of translucent water icing. It was the early ‘80’s and I thought my grey cake was unutterably chic and I was (perhaps rather too) pleased with myself for having ordered it. My palate was then educated by the discovery that this cake was primarily a textural experience; the somewhat challenging gritty feeling in the mouth and the ephemeral bitterness of the seeds making me sure that this was a cake for grown-ups, not children. An acquired taste. The recipe below is an amalgamation of several recipes I have tried in an attempt to reproduce that first piece of Mohnkuchen. The flavouring should be subtle, not too heavy with either vanilla or lemon, so that the delicate flavour of the poppy seeds comes through. 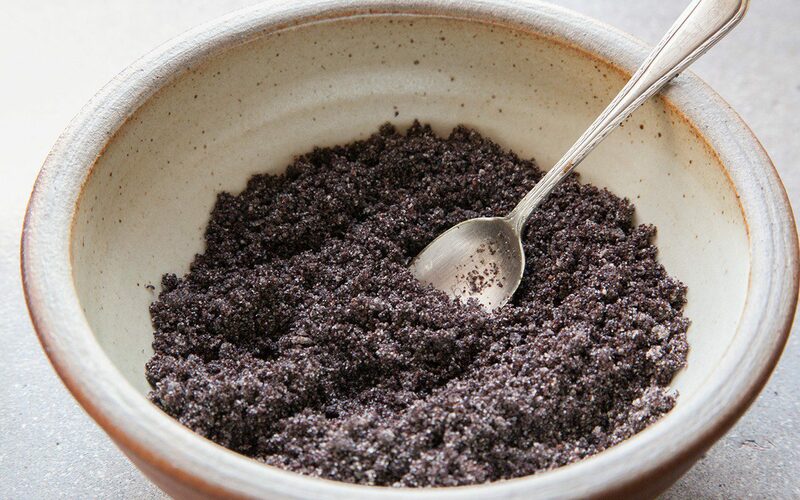 It is essential to grind the seeds in either a mortar and pestle or a clean coffee or spice grinder as, from experience, the blade of an electric food mixer is not up to the job. You will need to grind the amount of seed required for this cake in batches. You want to achieve the texture of wet sand, with a good balance of ground and whole seeds. When we have a good opium poppy harvest I take pleasure in using our own seed but, with the amounts called for, you need to have quite a poppy patch to produce enough. I use a richer yogurt icing here, which makes this more of a special occasion cake, but it is still very good with the traditional light water icing which, in Austria, is sometimes flavoured with rum for a truly grown-up cake. Butter a 22cm round cake tin and line with baking parchment. Beat the butter with the sugar and vanilla extract until pale and fluffy. Add the egg yolks one at a time. Beat well to incorporate fully before adding the next one. If the batter shows any sign of curdling add a teaspoon of the flour and beat until smooth. Stir in the yogurt until well combined. Then fold in the flour, ground almonds, poppy seeds and lemon zest. Beat the egg whites into soft peaks. Gently fold these into the cake batter a little at a time until fully incorporated. Pour the batter into the prepared cake tin and bake for 40-45 minutes, until a skewer inserted comes out with just a few crumbs attached. Allow to cool in the tin for 20 minutes, then remove from the tin, take off the baking parchment and put on a cooling rack until cold. To make the icing, in a small bowl stir together the yogurt, lemon juice and icing sugar until smooth. Pour onto the cake and spread out with a palette knife, encouraging it to flow over the edges. 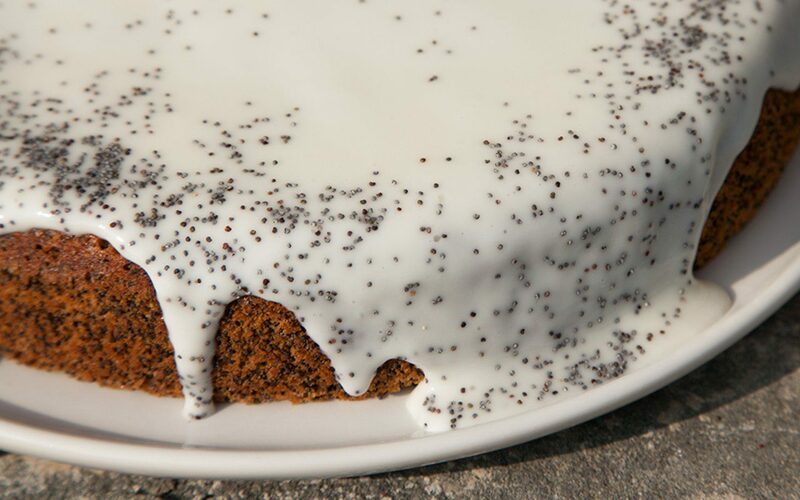 Decorate with poppy seeds.